Shooting Star condominiums are on the slopes near the Village center adjacent to the express chairlift and Empire Club Facility. All units are two or three bedrooms and units 403 and 404 have lofts. The building is patterned after historic grand lodges like those found in Yellowstone and Yosemite. The developer paid special attention to the materials and colors so the building is in harmony with the natural surroundings. 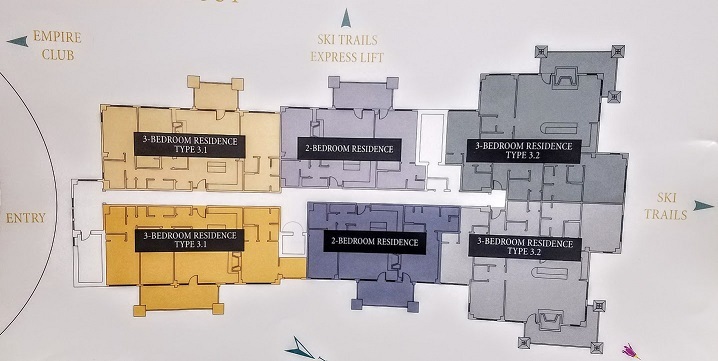 There is a lobby with a welcoming area, stone fireplace, underground parking, ski storage areas, and an elevator. The residences themselves offer a wide choice of plans and finishes. Shooting Star does allow for nightly rentals and the HOA includes Cable/Satellite, Com Area Insurance, Com Area Landscaping, Com Area Maintenance, Com Area Taxes, Management Fees, Reserve/Contingency Fund, Shuttle Service, Snow Removal, Unit - Gas, Unit - Sewer, Unit - Water. - Odd unit numbers look out to the North East to provide views and even room numbers provide slope side views.